It was my second pregnancy and things went well in general. I worked part time and with Leon, a 3 years old, to parent, time flew by very fast. This was not a bad thing as this pregnancy was a bit more challenging than the first one due to the hectic life I was leading and the heaviness of my bump. I started experiencing shooting pains in my hip, legs and back. This went on for a while until one day I could not walk due to the pain. This is when I contacted Amanda for some Acupuncture, which I combined with Osteopathy and Reflexology. The combination was a winner. I could finally move without pain. Another niggling worry hovering over me was that my placenta was lying low and so was told to take into account the possibility of a ‘C’ section if things don’t change. It was not the water birth I was hoping to recreate (as I had with Leon) but accepted that the health of my baby came first. After a lot of yoga practice, a few acupuncture sessions and baby doing his thing, my placenta moved, hurray!!! I could finally focus on the birth I wanted. On the eve of Friday the 13th (of January), and 6 days before the due date, I started having contractions every 10 minutes but they stopped after 3 hours. The following day my mum arrived to stay with us for a couple of weeks. I felt I could really relax now as I did not have to worry about Leon if I went into labour. On Monday (the 16th) evening I went to see Amanda for a session. I told her about Friday and she did something that as far as I understood, it was to free any blocked energy. I went home feeling relaxed yet energised. Around 2am I started having mild contractions. I went back to sleep as I thought they were too mild to be the real thing but soon enough I felt differently. Although the contractions stayed rather mild I knew that this was the real deal, baby was moving down. A couple of hours or so later I had a show. My other half called Crowborough birthing centre, where I wanted to have this birth (as I remembered it be a wonderful experience when I had Leon). To our surprise the midwife told my other half that the unit was very busy and in all her 23 years of working there, this was the busiest they had ever been and she did not know whether she was coming or going. Plan B had to kick in – Princess Royal Hospital. We were told the birthing pool was available, this cheered me up a lot. I rested until 5am then told my other half to let the hospital know we were on our way as baby was coming. I got all my bits together, woke my mum up and went to Leon’s bedroom to give him a kiss in his sleep. I noticed his bed was wet. He had not had a wet night in a very long time and so I wondered if he had intuitively sensed that things were happening. We got to PRH and by the time we parked and checked in it was 6:15 in the morning of the 17th of January. The midwife observed me for a while and we had a chat. At the end of that she told us that from her observations she did not think that I was in established labour and that if she was to examine me and I was not in established labour (an opening of 4 fingers we were told) then I would have to go home. I looked at her puzzled, as I felt very differently about the situation. She decided to go out of the room for a while to see if things would change. Whilst we were waiting, I felt the need to empty my bowls several times and I did. The contractions were still mild but I felt that I was starting to open. I kept moving, did my breathing and practiced some of the yoga moves for birth. The midwife came back and told us that she did not want to send me home due to the distance from the hospital but she did not want to examine me, as then she would have to discharge me. We were offered a walk outside and a cup of tea. I said to her that I didn’t think I could do much walking, as I felt the opening. As we were talking my waters broke with a gush. I thought to myself - my baby is doing his bit to help the situation. The midwife smiled and said that baby did not want to go for a walk. Once the water broke the contractions strengthened and strengthened. I could not find a position of comfort. I asked to go in the pool. The midwife asked me to wait as they were just having a shift change. The new midwife came to see me soon after. I told her baby was coming. Luckily she believed me and started to fill the birthing pool before she examined me. Birthing pools take a while to fill and this wait felt the longest so far. I was then examined and confirmed an opening of 5cms. I could just about screech “I can’t be only 5cms, baby is coming out, I need to go in the water now”. Soon enough I was in the water and 15 minutes later with about 2 pushes, baby Ethan was out in my arms all lovely and warm weighing 7.10lbs (3.45kg). Later I was told the second stage (the ‘pushing’) was only 4 minutes long. 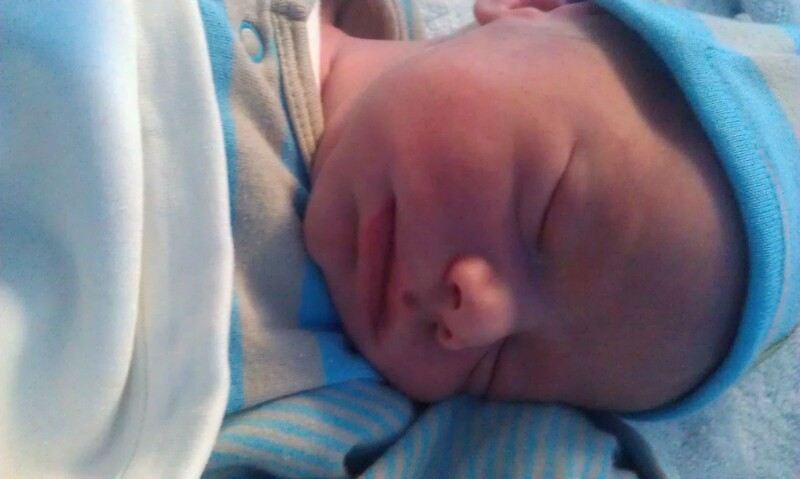 Ethan was born at 8:35am, only 2¼ hours since check in…. I could not believe it.